When I am working with clients, we often talk about how they can "eat the rainbow" or eat every color of the rainbow every day. Different colors of vegetables have different antioxidants and nutrients, so by eating a variety throughout the day, you are optimizing your nutrient intake. 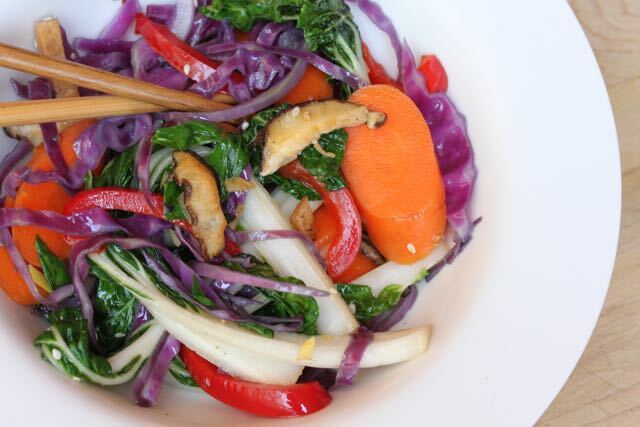 This Rainbow Stirfry recipe is a quick easy way to make a colorful dinner full of nutrients to support your fertility and get your ready for conception. It is easy to increase the recipe for leftovers to take for lunch the next day. You can add your favorite protein like chicken, steak or roasted chickpeas to complete the meal. In a large skillet, heat oil and add onion. Sauté for a few minutes, then add shiitake mushrooms, carrots and bell pepper. Stir-fry for 4-5 minutes, adding water to the pan by the tablespoon if the veggies start to stick. Next, add bok choy, garlic, tamari sauce and rice wine vinegar. Grate ginger over top if using. Toss to combine and continue tossing until bok choy has wilted. Turn off heat, sprinkle red pepper flakes over the veggies and serve over brown rice.